In nature, the general rule is that big fish eats little fish. Obviously, this doesn't apply solely to fish! However, every rule has an exception. 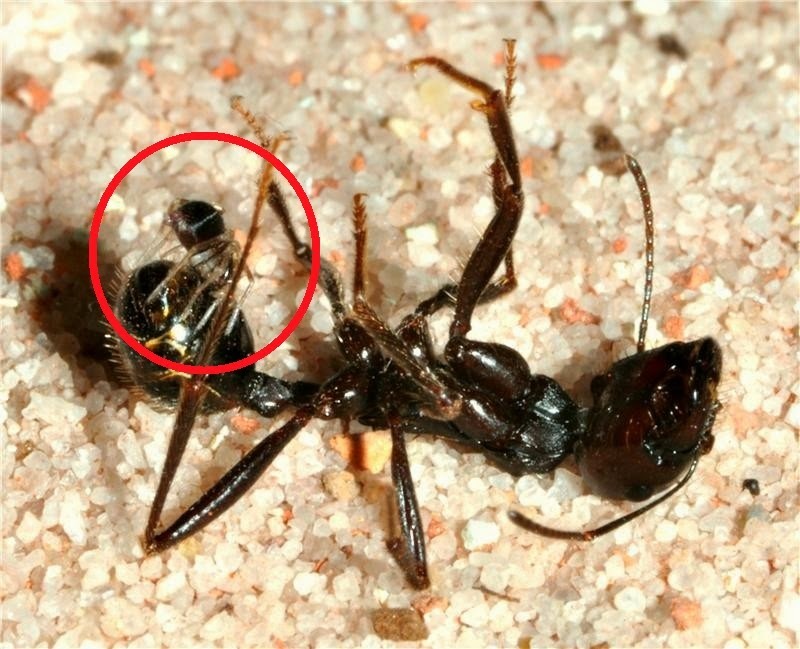 One such notable exception is Zodarion cyrenaicum, a tiny spider from the Negev desert, Israel that feeds almost exclusively on the 4-times bigger, Messor arenarius ant. M. arenarius ants grow to be up to 1.7 cm (~0.6 in.) long and as you can see on the image on the left, these spiders are literally dwarfed by their prey. Interestingly enough, even juvenile individuals prefer to hunt the same ant species, instead of other smaller ants. Why don't juveniles feed on smaller species until they get bigger, like other Zodarion species do? And how does this little spider accomplish this modern "David versus Goliath" feat? Now, new research by Stano Pekár from the Masaryk University in the Czech Republic sheds light into these questions. In the new study, appearing in Springer’s journal Naturwissenschaften, Pekár and his team observed the natural prey and predatory behavior of Zodarion cyrenaicum, both in the field and in the laboratory. The scientists suggest that the spider's special preference is probably because it recognizes a specific component of a pheromone that the ant produces. M. renarius ants come in two versions (or better morphs), a large and a small one. The researchers discovered that adult females tend to capture the large morph, whereas the much smaller juveniles prey on the small morph. In both cases though, the ant is a giant compared to its hunter. And what is even more interesting, is that the "Goliath" is always defeated by a single "David". Previous research by Pekár's team, revealed that the capture strategy of female adults includes a fast venomous attack from behind, followed by a quick retreat to avoid retaliation. The new study showed that juveniles attack in a different way. Their tiny size allows them to climb on the dorsal side of the ant. There, they deliver a venomous bite to the abdomen, that immobilizes the victim. Although their venom glands are 50 times smaller than the ones of adults, the venom is still quite potent, taking it less than twice as long to paralyze the victim. "The venom glands of adults were more than 50 times larger than those of juvenile spiders, but the paralysis latency of juveniles was 1.5 times longer." excerpt from the study's abstract. The new research suggests that the species' venom is very potent, even in the juvenile stage. The greater success of adults is most probably due their capacity to produce and inject much higher amounts of their venom. "Specialized capture combined with very effective venom enables this ant-eating spider to capture giant prey." Pekár stated in the corresponding press release. "We discovered here that specialised capture combined with very effective venom enables the capture of giant prey." excerpt from the study's abstract. I've never heard of anythinng quite like this before. It would be interesting to know why the spider has evolved to attack such large prey, presumably one ant is far too much food for a single spider. I also wonder if the ants have any defences against the spiders, or are they completely defenceless?